The most important thing to say about this snarky is that a.) it's a real-life use case, and b.) I've used it. It's hard for management to argue in a large company that cross pollination is a bad thing, although there are limits put on someone skipping out in order to maintain a level of slacking to which they might be accustomed. I have a laundry list of statements that tend to get you past that uncomfortable, "I'm applying for another opening in house" conversation with a manager. Here are just a few. I’m exploring my options. I like to know what’s out there. Sometimes it means I meet someone who might apply here when we have an opening. I’d like to contribute at a higher level some day, and that means exploring many parts of the business. Did you know there’s a book written by an in house author that says the best employees have had a breadth of roles and eventually even work a customer-facing job at some point? How does management feel about how long I’ve been in this role? Do YOU think I could benefit from another experience? 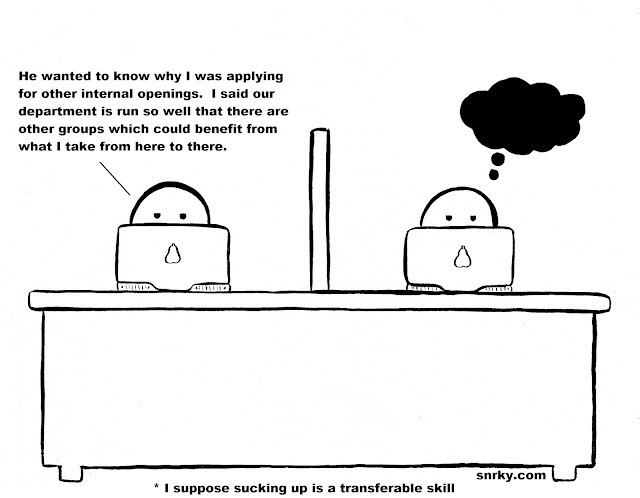 Snarky: He wanted to know why I was applying for other internal openings. I said our department is run so well that there are other groups which could benefit from what I take from here to there.